A truly alien and inexplicable godlike creature from a dimension beyond human ken, Cthugrosh was summoned to Earth by the depraved sacrifices of his occult worshipers, all of whom were slain upon his arrival. 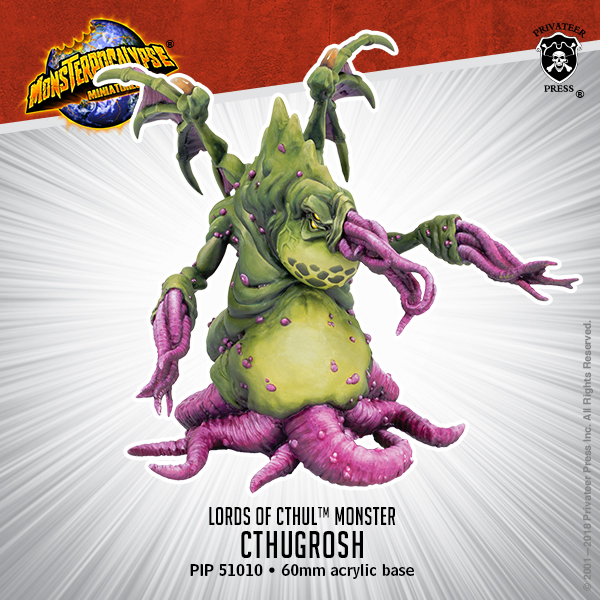 Heralded as a bringer of apocalypse, Cthugrosh is one of the greatest Lords of Cthul, an entity that draws power from carnage and whose gluttony for life’s energy seems inexhaustible. Alien as his mind is, it is also immensely powerful, capable of tremendous feats of telekinesis and unleashing mind-rending surges of pure energy.